I’ve been meaning to do a quick post about a start-up I’ve been advising and am really interested in promoting but just haven’t had the time to really dig into for a while. I’m afraid to say that this post isn’t going to do justice to the importance of a toolkit like Nilsby, but it’s enough to say that a community like this is much needed for the millions of families with a special needs child. The start-up is called Nilsby and it focuses on creating an online community for special needs students, teachers and families. 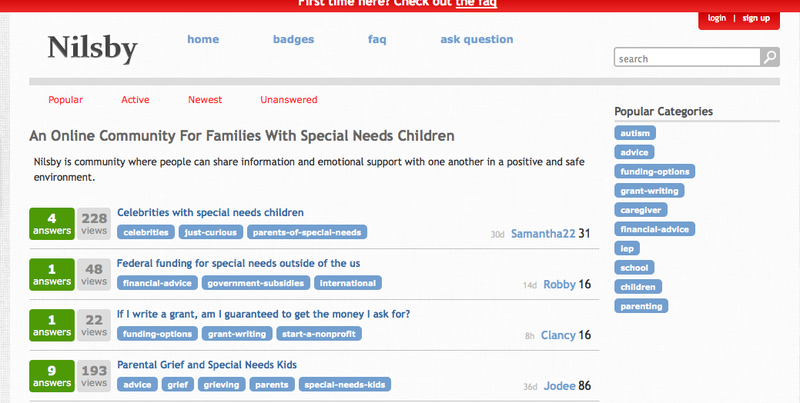 The site allows members of the special needs community to ask questions of each other, offer advice and provide support. The startup just got out of private beta, and they looking for people to add content and help grow the site. If your a teacher or parent with a special need student, this site is for you and I’d encourage you to check it out today.